Find out what the organization does. Share the list of issues and concerns you made for requirement 1. Ask the people you communicate with which issues are of greatest interest or concern to them and why. Draw a diagram showing how the organization is structured, from the local to the national level, if applicable. Develop a time line of significant events in the history of the American labor movement from the 1770s to the present. 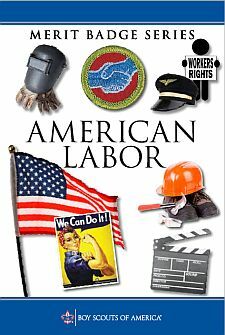 Prepare an exhibit, a scrapbook, or a computer presentation, such as a slide show, illustrating three major achievements of the American labor movement and how those achievements affect American workers. With your counselor's and parent's approval and permission, watch a movie that addresses organized labor in the United States. Afterward, discuss the movie with your counselor and explain what you learned. Read a biography (with your counselor's approval) of someone who has made a contribution to the American labor movement. Explain what contribution this person has made to the American labor movement.